In the mid nineteenth century, the hermit kingdom of Korea will do anything to keep foreigners and Christianity out. However, one brave missionary will do anything to bring the light of God into this dark land. 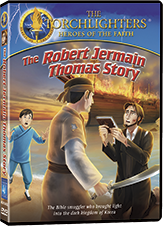 With the help of some Korean fishermen hungry for truth, Robert Jermain Thomas risks everything to smuggle in a treasure beyond all imagination. But what will his bravery cost him? And will the Word of God bring light to this dark kingdom?